In the history of the NBA, we have seen a lot of “what ifs.” From trades that did (or didn’t) push through (imagine if the New York Knicks never traded half of their roster to acquire Carmelo in ‘11), draft selections that were made by team executives (12 teams passing on Kobe in ‘97) to coaches getting fired (what if Tom Thibodeau was still in Chicago? ), these what-if situations have played a huge role in the future of a franchise even up to this date. Believe it or not, it wasn’t long ago when the Oklahoma City Thunder had all 3 of the top 5 players in the league today. From the draft classes of 2007 to 2009, the Seattle Supersonics/OKC Thunder were able to land Kevin Durant (#2 in ‘07), Russell Westbrook (#4 in ’08), Serge Ibaka (#24 also in ‘08), and James Harden (#3 in ‘09). That’s the best 3-draft span of any team in NBA history! (Even the San Antonio Spurs didn’t draft that well and that says a lot). 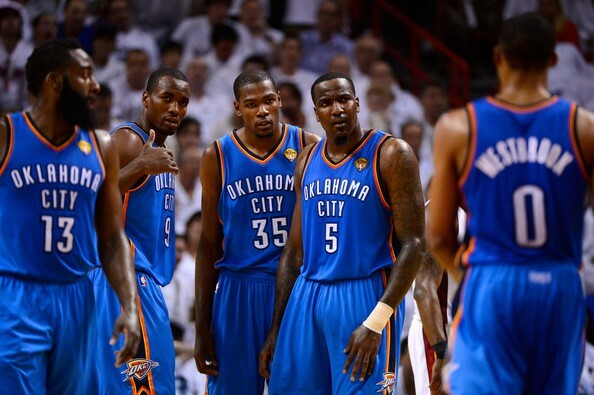 As early as 2009, we were seeing the potential from the young core of OKC. After drafting Harden, the Thunder wound up with a 50–32 record that gave them the 8th seed in the West but were knocked out in the playoffs by the LA Lakers. It was clear from the onset that all signs were pointing up for OKC. The following year, they went as far as the Conference Finals and a date with another eventual champion, the Dallas Mavericks, before losing in 5 games (which really should have been a 7-game series). In the lockout shortened season of 2011–2012, the Thunder were finally able to show what they can do to the league for the foreseeable future. On their way to the first NBA Finals trip, OKC knocked out Dallas (sweep), Lakers (in 5), and Spurs (in 6) — all of which had enough championship experience but couldn’t really keep up with them. Though they failed to capitalize a Game 1 upset against the Heatles in Miami, it was all but certain that the West would go through the Thunder. Let the dynasty begin! Durant and Westbrook were legitimate MVP candidates. Ibaka was a legitimate DPOY candidate. Harden was a legitimate SMOY candidate. Scott Brooks was a legitimate COY candidate. Sam Presti was a legitimate EOY candidate. (I was legitimately running out of acronyms to work on). Except for the Miami who had peak LeBron, no other team was spoiled more than OKC. What more could they ask for right? Probably a few million dollars. In the offseason shortly after the 2012 NBA Finals and with 1 year left on his rookie scale contract, Harden was eligible for an extension (if he hadn’t signed one, he would enter the following offseason as a restricted free agent). One problem, though — if James had signed the max extension (4 year — $64M), it would put the Thunder over the salary cap. AND OKC WASN’T GOING TO PAY THE LUXURY TAX (the penalty that a team pays for each dollar they exceed the salary cap; roughly $1.25 for every $1 over the limit). NO WAY. Not even if it meant having a young team that could contend for a whole decade AT LEAST. With all the money invested in 4 of their starting 5, you would believe the Thunder would have no problem digging a little deeper into the pockets and sign the Beard (this was the same team that thought signing Perkins to a $36M contract was money well spent). But both OKC owner Clay Bennett (net worth of $400M though!) and GM Sam Presti weren’t ready to commit to having a 3rd max player and they kept playing the “we’re a small market team” card. Harden wasn’t going to give in; he knew his worth. OKC wasn’t going to give in too; they know they can lowball him. In the end, a 4-year $54M “take it or leave it” offer wasn’t enough and OKC traded him to Houston for scraps. Losing Harden was a tough pill to swallow but OKC was still confident that they were heading in the right direction. 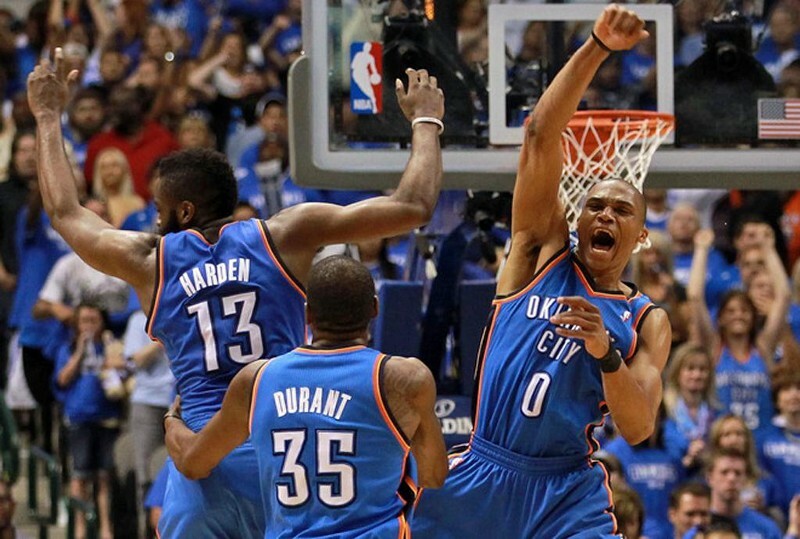 Until… Westbrook tore his meniscus in the 2013 Playoffs (that led to the #KDforMVP movement), Durant suffered a Jones fracture to start the 2015 campaign (that led to a #FREEWESTBROOK movement) and the OKC Thunder falling 1 game short of advancing to their 2nd NBA Finals appearance during the 2016 Playoffs (a season in which OKC’s payroll was 2nd highest in the league). Just like that, the window has closed. 5 years since the James Harden trade and GM Sam Presti had no choice but to blow up the core. He traded Serge Ibaka to Orlando for Domantas Sabonis and Victor Oladipo in a last-ditch to sell the vision of the team’s direction to Kevin Durant, before eventually moving on to Golden State. KD knew what everyone thought at that time — OKC was supposed to be in the position of GSW but it never materialized. They failed to get over the hump as they watched the San Antonio Spurs and Warriors leave them behind in the Western Conference pecking order. With Durant now in San Francisco, Sam Presti threw everything but the kitchen sink to make Russell Westbrook stay (spoiler alert: he did). The word “triple double” has been undervalued this season thanks to Russell, who has been on a tear ever since the year started. In the 49 games that he’s played, Westbrook is AVERAGING a triple double (30 pts, 10 ast, 10 rebs), virtually becoming a one-man offensive powerhouse (check out his usage rate) that we haven’t seen since Kobe circa ‘05–06. He leads the league in PER (rating of a player’s per-minute production) and has OKC competing for a playoff spot in the always tough Western Conference. In Houston, Harden has led the Rockets to the 3rd best record in the league and could potentially go for 2nd seed as soon as the Spurs decide to rest their stars for the postseason. The Beard is leading in both Value Added (points the player added to his team’s bottom line on the season) and Expected Wins Added (wins the player added to his team’s bottom line on the season) categories, showing how valuable he has been for the surging Houston Rockets. His move to the point guard was a pure genius decision from Mike D’Antoni, allowing him enough freedom to create for himself and his teammates. In the Bay, Kevin Durant is enjoying arguably his most efficient season by averaging a career high in field goal percentage (55%), true shooting percentage (66%! ), rebounds, blocks, and even career-low on turnovers (Yahoo! Fantasy Basketball MVP), all while having surpassed Stephen Curry as the Warriors’ best player (yes, I said it) and leading Golden State on pace to become the first team in NBA history to win 70 seasons BACK to BACK. These 3 have built their case to become this year’s Most Valuable Player. It could go to Westbrook who has been the best player this season, or Durant who has been the best player on the best team, or Harden who has been the best player on the most improved team. It’s hard to think about what could have been if only OKC was willing to pay a few million dollars more to retain Harden’s services in 2012. 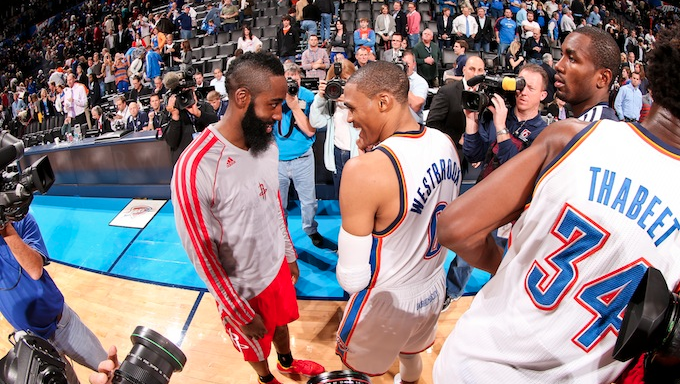 Could Durant and Westbrook co-exist better with Harden being the glue guy? Could they be the reason why LeBron goes back to Miami again and form another superteam with the sons of Chris Bosh and Dwyane Wade? Could they have dominated the league the way we predicted them to do so before? Could they have already won their first of many championships? We’ll never know. But what if, right? This entry was posted in Basketball, NBA and tagged Blog, Durant, General Sports, Golden State, Golden State Warriors, GSW Warriors, Harden, Houston Rockets, James Harden, Kevin Durant, NBA, NBA Trade, OKC Thunder, Oklahoma City, Oklahoma City Thunder, Russell Westbrook, Sports, Trade, Westbrook. Bookmark the permalink.